In small bowl, stir olives, giardiniera, Italian seasoning, oil, garlic and pepper flakes together until well mixed. Place roll halves on work surface, cut sides up. Tear bread from top and bottom halves, leaving about a 1/2-inch shell. Divide olive mixture among tops and bottoms of rolls. Layer salami, mortadella, prosciutto and cheeses on roll bottoms. Replace roll tops; wrap each sandwich with plastic food wrap, lightly pressing each sandwich. Refrigerate at least 2 hours but no longer than 12 hours. When ready to serve, unwrap, and cut in half. 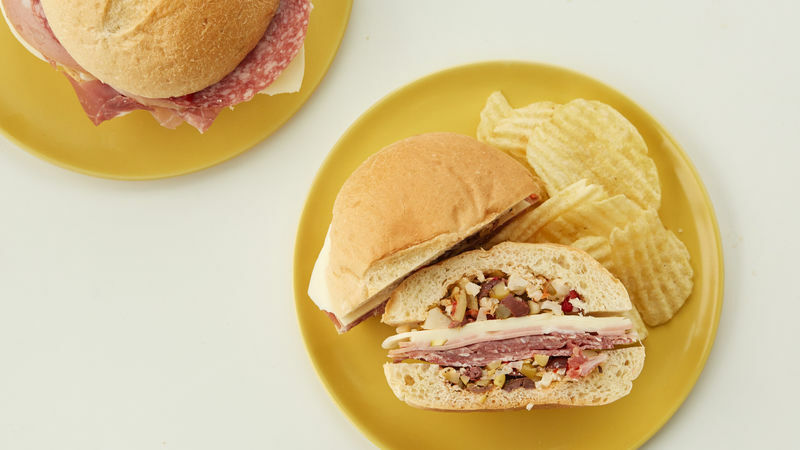 These sandwiches can be made ahead, tightly wrapped and stored for up to 2 hours in the refrigerator.